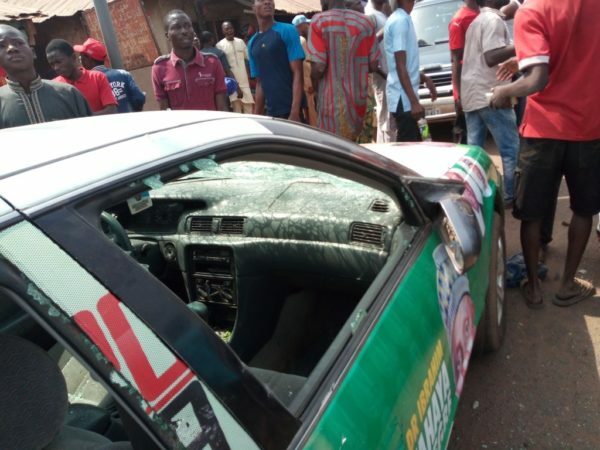 Kwara state governorship candidate of All Progressives Congress (APC) AbdulRahman AbdulRazaq on Sunday narrowly escaped death from suspected Peoples Democratic Party (PDP) thugs. The suspected PDP thugs fired at a rally the governorship candidate was attending at Ode Alfa Nda area of Ilorin, the state capital. AbdulRazaq, who had on Saturday begun a door-to-door mobilisation of voters in Ilorin, was said to have been hurtiedly spirited away from the rally as thousands of party supporters also scampered for safety. Two person, it was gathered, were seriously injured by gunshots fired by the thugs at the rally and have since been taken to the hospital. The violence occurred almost simultaneously with similar attacks on APC supporters in Ile Aiyelabegan, a household that is a diistance from the Agbaji homestead of the Senate President Bukola Saraki. Reacting to the development. Mallam Abdulrazaq media aide Rafiu Ajakaye said, â€œwe condemn this brazen resort to violence. This is getting out of hand. Nigerians are urged to prevail on the Senate president to prevail on his party thugs and stalwarts to give peace a chance in Kwara. There is life after politics,â€ Rafiu Ajakaye, media aide to the AbdulRahman AbdulRazaq campaign organisation, said in a statement.